Accumulating evidence has demonstrated that cytokine-induced killer (CIK) cell immunotherapy may improve outcomes when used as an adjuvant to current standard treatment. Previous studies showed that cell signaling through MHC I-related Chain A (MICA)-Natural killer group 2, member D (NKG2D) results in CIK cells activation leading to cytolytic activities against tumor cells. In this study, we determine the relationship between the expression of MICA in gastric cancer tumors after D2 gastrectomy and the clinical outcome of a CIK containing adjuvant therapy. From January 2009 to March 2012, ninety-five consecutive patients with gastric cancer after D2 gastrectomy who received adjuvant chemotherapy combined with CIK cell therapy were enrolled (Table 1). The MICA expression of their tumors was determined by immunohistochemistry (IHC). The IHC score of was obtained by adding the intensity and percentage scores. The MICA protein was detected mainly at the cell membrane and in the cytoplasm (Fig.1). High-expression of MICA protein, with IHC scores of 5-7, was documented in 38 of 95 tumor samples (40.0%). The MICA status was significantly association with the age and stage, p=0.008 and p=0.023, respectively (Table 2). Phenotypic analysis of NKG2D on in vitro expanded CIK cells showed that the percentage of NKG2D+ in CD3+/CD56+, CD3-/CD56+, and CD3+/CD8+ cells populations were 97.2±1.4%, 97.9±1.8%, and 95.6±2.1%, respectively. For the 95 patients, the median DFS was 42.0 months, 95% CI = 40.82-43.18 months, and median OS was 45.0 months, 95% CI = 41.82-48.18 months, the 3-year and 4-year DFS rates were 70.5% and 34.7%, respectively, and the 3-year and 4-year OS rates were 82.1% and 49.5%, respectively (Fig. 2A). 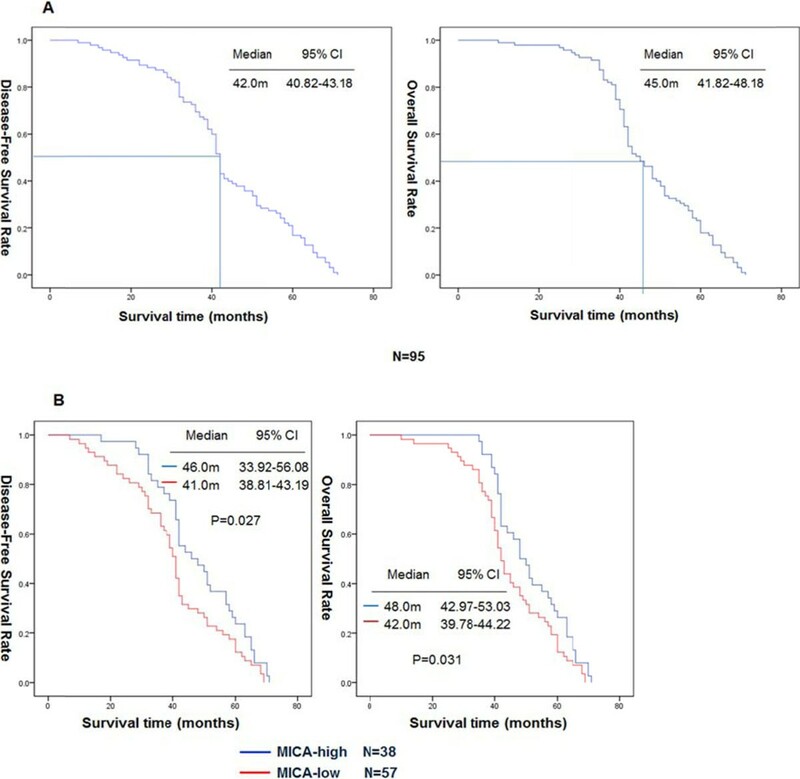 For patient with high MICA expressing tumors the median DFS and OS were longer than for the patients with tumors with low expression of MICA; 46.0 months vs. 41.0 months (p=0.027), and 48.0 months vs. 42.0 months (p=0.031), respectively(Fig. 2B, Table 3). In a multivariate analysis, stage and MICA expression were independent prognostic factors for DFS and OS (Table 4). Our findings show that adjuvant chemotherapy plus CIK therapy treatment is a promising modality for treating gastric cancer patients after D2 gastrectomy. Especially, those who have tumors with high-expression of MICA were more likely to benefit from such a treatment strategy. Subsequent studies in clinical trial cohorts will be required to confirm the clinical utility of these markers.